Stop the cries of 'But I want to be a bridesmaid too!' from your young female acquaintances by giving them the job of flower girl. The role's got everything they could want - a pretty dress a task they can call their own, and the chance to be the centre of everyone's attention for a few minutes! Typically, flower girls are female and aged between three and eight years old. Any younger and they'll have difficulty understanding what's required of them, any older and they may look down on the task as too babyish. 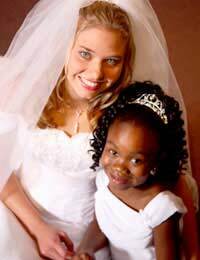 If you've got any doubts about older children's willingness, the best thing to do is ask the child directly - they can only say no!It can be a good idea to have two flower girls if your chosen attendants are particularly young or nervous, as they'll be able to keep each other calm on the trip down the aisle. If you've only got one suitable female relative, see if she's got a friend who'd like to accompany her. Flower girls walk down the aisle as a 'scene-setter' before the bride's big entrance. They usually carry either a basket of flower petals that are scattered on the floor for the bride to walk on, or a posy of flowers to be handed out to guests as they pass.If you're not really into the idea of walking on rose petals, fill your flower girl's basket with other offerings - feathers or confetti to scatter, or wrapped chocolates to pass out down the aisle. For a really great effect, give her a bubble blower and let her fill the aisle with bubbles as you walk down! Going down the aisle first is likely to be pretty intimidating for the flower girl, so do what you can to make the experience comfortable. Ensure she comes to the wedding rehearsals and goes through her duties with a makeshift basket, preferably more than once so she's totally confident. Make sure she's also familiar with the bridesmaids by introducing them beforehand, which will help calm her nerves outside the church. Some people like the idea of a miniature 'bride' costume for flower girls, but it's not really appropriate to their age to dress them like adults. Go for something a child will be able to handle - a calf-length skirt instead of a floor-length one, with no fussy necklines or sleeves to get in their way. Or you can play on little girls' love of dressing up and put them in a costume - a fairy or princess outfit's guaranteed to delight its wearer! Accessories can include a flower-trimmed Alice band, or a wrist corsage, which leaves the girl's hands free to hold her basket. If she's wearing a costume, make sure she has fitting accessories such as a wand. (You could try incorporating a bubble-blower into the end of this so she doesn't have to hold more than one item). If you're on a budget, rather than opt for a specialist satin or organza dress, try cotton sundresses in plain colours or floral patterns. With satin ribbon sashes and the right flower-trimmed accessories, these will look ideal at a summer wedding and have the added bonus of being re-usable once the ceremony's over. At the church, select a bridesmaid to be the flower girl's 'buddy' before the ceremony, who will be able to deal with requests for toilet breaks, last-minute dress emergencies etc. Make sure the flower girl's parents are seated on the aisle and leave a space next to them, so she can sit down once her part of the procession's over. Suggest also that they bring a change of clothes to the reception, which will allow the child to remove her finery before engaging in rough-and-tumble with the other kids. At the reception, leave your flower girl in no doubt how grateful you are by handing over her thank-you gift straight away. After a day of dressing up and hogging the limelight, getting a gift will be the icing on the cake for her!